New Details For Warhammer Fantasy Roleplay 4th Edition! We previously uncovered details about Warhammer Fantasy Roleplay 4th edition at Gen Con 50. In a surprising bit of late night news, art director Jon Hodgson revealed new details about WFRP 4e. Specifically, it appears that both a Starter Set and Core Rulebook are being published. Does this mean that Warhammer Fantasy Roleplay fans can expect the Starter Set by the end of 2017, with a Core Rulebook to follow later on in 2018? 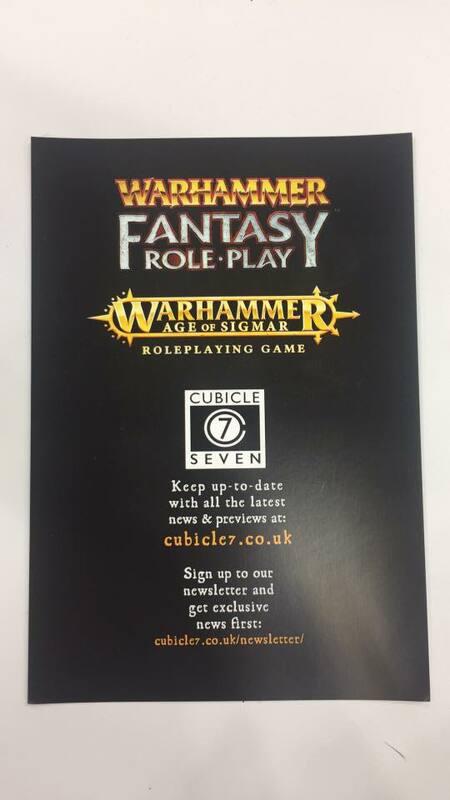 Stay tuned on our Facebook page, or sign up for Cubicle 7 Entertainment’s newsletter to get more up-to-date information on Warhammer Fantasy Roleplay 4th edition. No details regarding release date. However, Cubicle 7 has advertised 2017. Cubicle 7 (C7) has told fans that WFRP 4e will be released normally, meaning it won’t have a Kickstarter to raise funds. WHFRP4 will be a bit different from first and second edition, but “if you stood on their shoulders, you could clearly see 4 from there”. It will not borrow anything from third edition, and is clearly looking to be the latest evolution of the classic D100 percentile system. Default setting of WFRP 4th edition is The Enemy Within era of the Empire. By dialing the timeline back, they’ll let everyone enjoy the classic ‘Old World Feel’ and decide for themselves how far they wish to go into the Storm of Chaos/End Times material. WFRP 4e is meant to be the “Look, a Bloodthirster! Run!” game, while Age of Sigmar is meant to be the “Look, a Bloodthirster! Charge!” game. Different power levels, different gonzo levels. C7 said that while they and other writers on WFRP4 are big fans of the classic Old World, they’re actually really looking forward to Age of Sigmar as a chance to do something that feels very different within the Warhammer mythos. C7 said they have hopes to develop Age of Sigmar’s setting into something very special, and those who were originally turned off by Age of Sigmar should give the RPG take on it a second look. C7 said the current regime at GW is very enthusiastic about RPGs and is a dream to work with. C7 has already been offered free ad space in White Dwarf as a way of supporting the rpg-end of the Warhammer hobby.